Twenty hikers said goodbye to the year 2015 by hiking the fun and amazing loop of Arizona Hot Springs (aka Ringbolt Hot Springs) in the Lake Mead NRA. 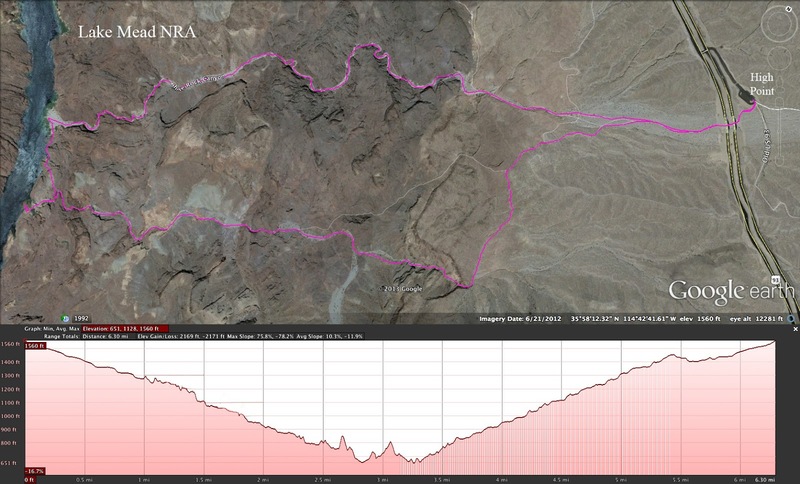 The route that we hiked today has hot spring pools, fantastic geology, petroglyphs and great dry fall scrambling. 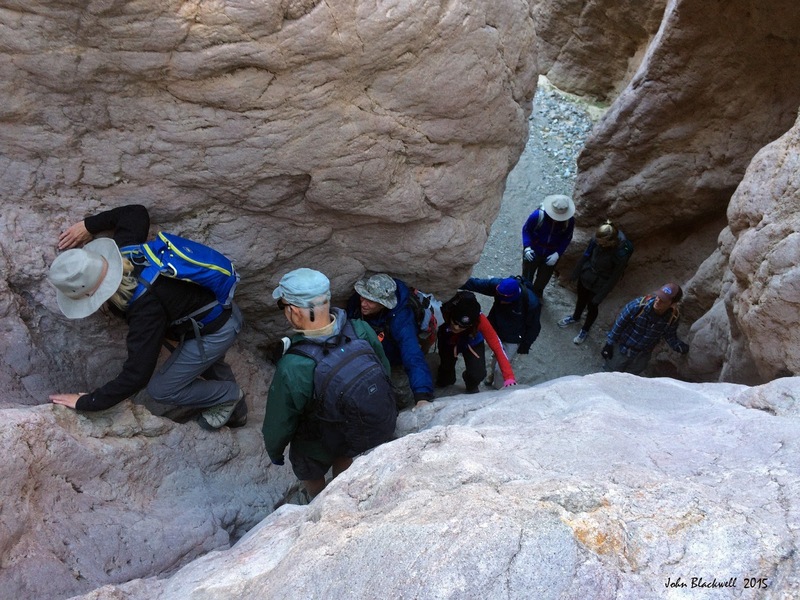 With AZHS Ambassador John B. at the helm the hike was sure to be fun and informative! So, we parked at the mile marker 4 on Highway 93 in Arizona (4 miles south of Hoover Dam) and began our hike by dropping down the hill at the end of the parking lot and going under the highway bridges. There is a wildlife camera placed on one of the trestles to keep tabs on whether the bighorn sheep are crossing the highway underneath or over the top on the specially made wildlife bridges. 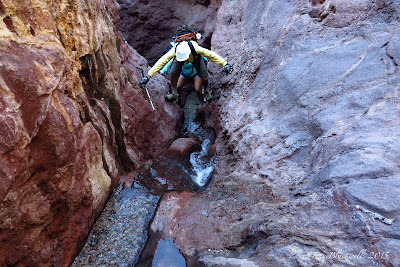 The trail continues down this wide wash that emanates from the Wilson Range to the northeast. This wash is named White Rock Canyon for the large white granite rocks in the canyon that came from the Wilson Range eons ago. As the canyon narrows, there are many twists and turns. The walls rise higher and higher on both sides and the light plays delightfully on them. 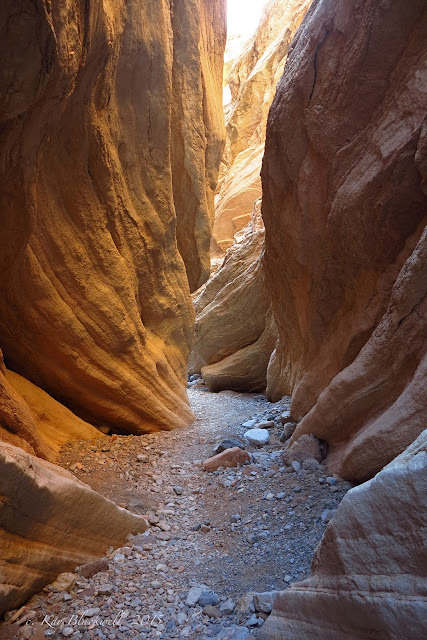 There are a few small scrambles as you hike down through the sandy gravel and it was clear to some of us that the flood this canyon experienced one and a half years ago deepened these small drops. The morning was a bit nippy so the strong hikers in the group had a need for speed to warm up their bodies with exertion. The group spread out and the canyon's curves hid us from each other at many points. There was just a little wind during the descent so the shade was comfortable. But when the group reached the Colorado River at the bottom of the canyon, the sun was welcome. A small break was taken here then we turned to the left and began the crossover trail along the river. New signs pointed the way. The crossover trail climbs up to Ringbolt Rock outcropping. A large metal ringbolt is still embedded in the rock and was used to assist large steamboats in their struggle to make their way upstream before Hoover Dam was built. This manuever was used at this spot from 1865 until the dam was built. At this time, the hot springs, found just beyond this site, were called Ringbolt Hot Springs. The trail then climbs up a steep scramble and down to the next canyon wash. We went back out to the river and had our snack break on the beach in the sun. Pit toilets are provided here where many campers / kayakers were set up. At the break, some hikers began preparing for the upcoming slosh through the hot springs pools by removing pant legs and putting on water shoes. After the break, we hiked back up this wash to the slot created by the hot springs beyond. The scramble going up through the slot is slippery. Shoes get wet and fun is had. At the end of these scrambles, the springs flow over a twenty foot cliff. The park service provides a ladder here and we began climbing up one by one. 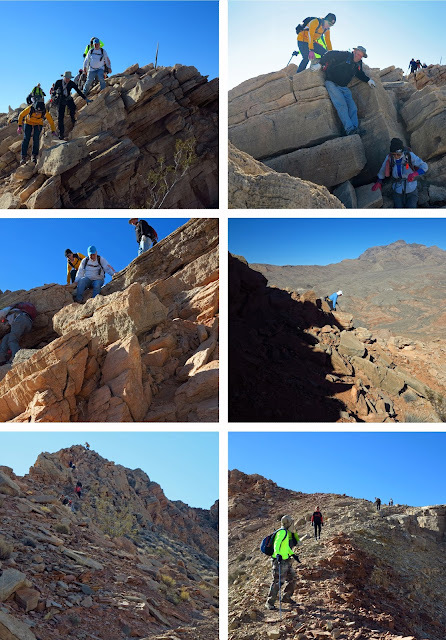 At the top of the ladder, there is a dryish area where everyone finished dressing down for the "hot springs traverse." There is no choice in this matter. Traverse or return from whence you came! So, all twenty hikers made their way through the ever hotter water interrupting the jubilations of three soakers in the last pool. One note: The small pebbles on the bottom of the pools are sharper than before the flood of August 2014! Bring water shoes. On the other end, we climbed out and redressed. We felt like we had just gotten out of a hot bath. Rubbery legs and all! 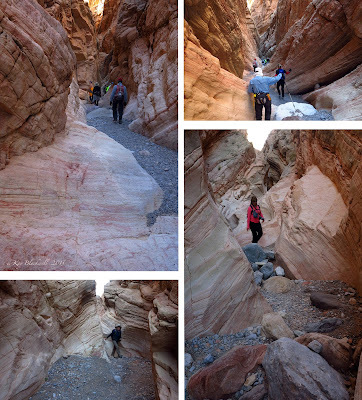 Now in the Hot Springs Canyon, we began trudging up through the sandy gravel of a wide wash. 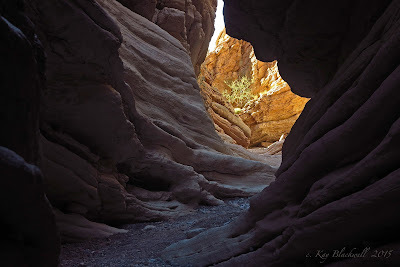 Eventually, this canyon has many shortcut trails beside the wash that, thankfully, take you out of the deep gravel and allow for an easier climb. There are several medium sized scrambles as the canyon narrows. The rocks are round and slippery so strength and skills are required. 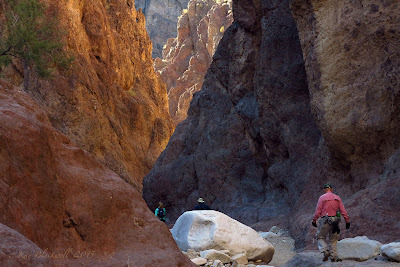 Almost half way up this canyon, a huge cairn was built and rocks are placed across the wash to deter hikers from missing the saddle return trail. 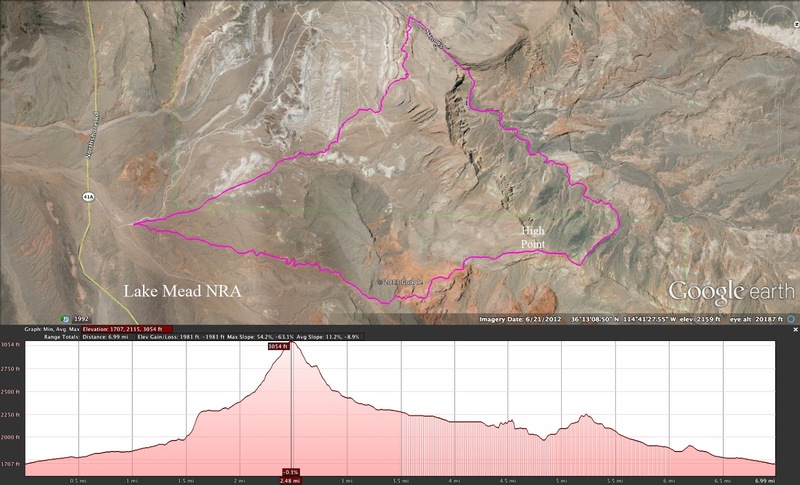 The saddle was not our route for today so we continued up a trail that paralleled the canyon. 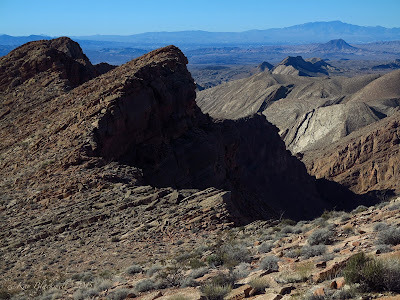 We began crossing the canyon wash from trail to trail but our route basically continued up along the wash. We came to the huge canyon fork and kept to the left. It is in this area that several rocks covered with petroglyphs reside. They are an interesting and unique display created by early Native Americans. Next came the first of three large dry falls. This one is fairly easy to climb on the right side using hand and foot holds offered on the rough conglomerate. The next dry fall is the most difficult as it is slippery to climb. The third dry fall has to be circumvented by climbing up a previous rock wall on the left. This one is the highest, most exposed and most fun! 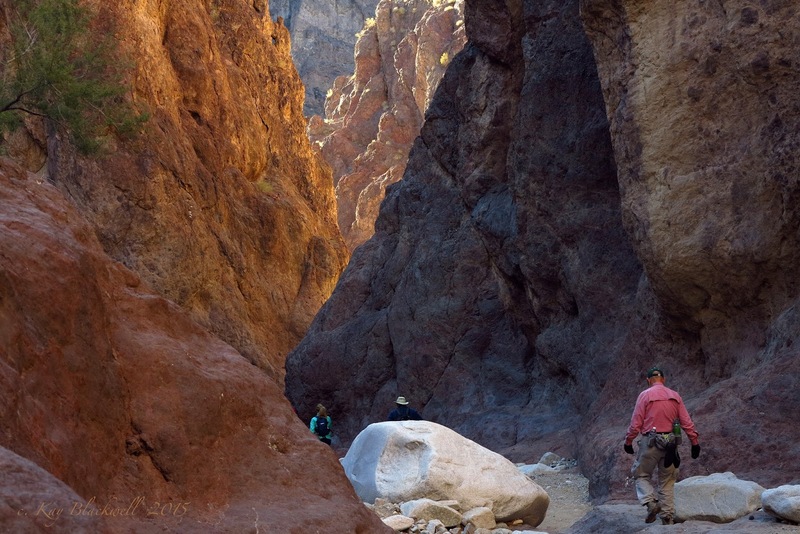 Once at the top, hikers circle around and drop into the canyon once again. (There is a rope at the dry fall that is not tied correctly. Please do not use.) 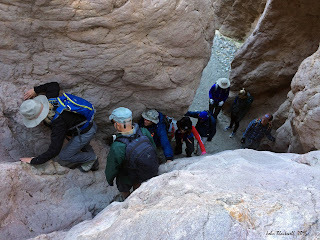 After all twenty hikers placed their feet on solid ground once again, we exited the small canyon and followed the clear trail back over to the White Rock Canyon wash near the highway bridges. 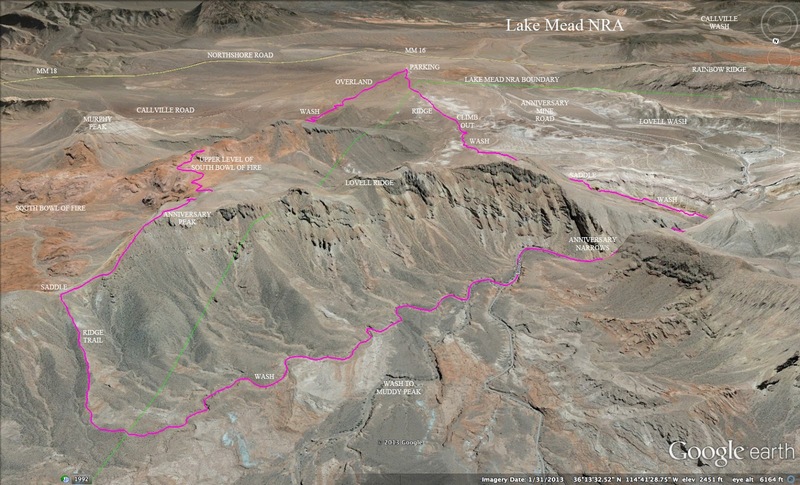 This is a fantastic hike that should be listed as a "Best Hike" somewhere! 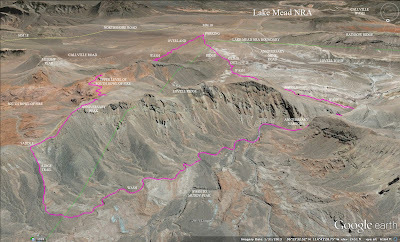 As one hiker related today, "This is one of the top 6 hikes that brings us out to the Lake Mead NRA!" This hike has almost everything in the way of terrain, beauty and interest. Nevertheless, it is being threatened by outside interests. 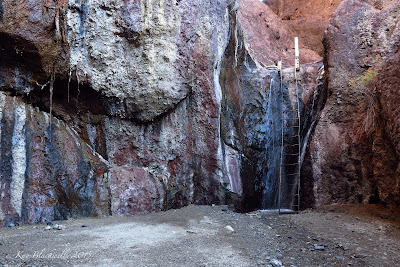 When a new mining company bought the old Ore Car Mine and the surrounding land, access to the famed Anniversary Narrows became easier to begin with. As time went on, ... and it only takes one incident like this ..., someone decided it was a good idea to sue the mining company for damage to his/her car which he/she probably parked in the wrong place amid mining trucks and machinery all around. Yep. That old insurance company put a stop to the public being able to drive onto the mining property at all. Zilch. So, up went a gate. Public all up in arms. How could access to Anniversary Narrows be blocked? Unthinkable! So, after months of the public not really believing this could happen, an eastern route to the narrows was reborn. And, although the eastern route still trespasses on private property, see no evil, hear no evil. 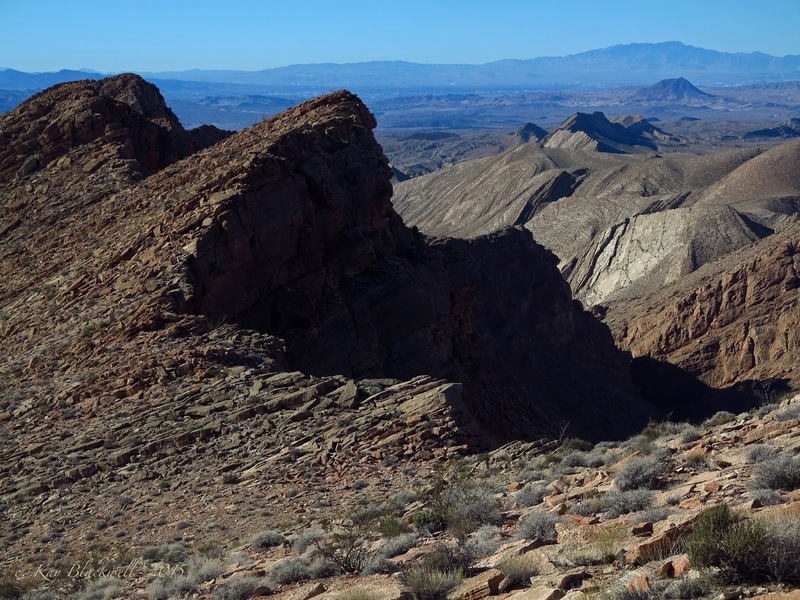 Now ... the first time a hiker says "Boo" to the mining company's insurance company, we are dead in the water ... er ... desert. Behave yourselves out there, will ya? 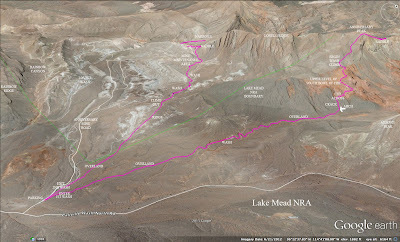 So, we drove out Northshore Road to mile marker 16 and turned left (away from Lake Mead) onto Anniversary Mine Road. Just after crossing the Callville Road and wide wash, we parked on the side where there is a small wash that junctions there. Our hike started out that small wash. 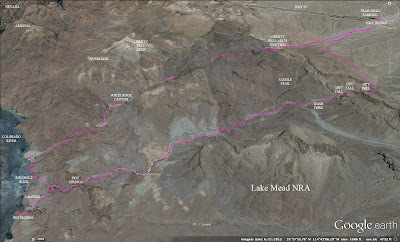 When we got past several arroyos, we climbed out of the wash to the left and began an overland hike toward the ascent crack in the small range in front and to the left of our direction. Eventually, we had to drop down into a very deep wash still traveling toward that crack. Our first break was at the bottom of the crack. The crack ascent is very steep but the rock is very "sticky" and facilitates the climb. Bring gloves! At the top of the crack, just past the large boulder wall on the right, the route turns to the right and crosses over to a saddle then drops down onto a plateau that lies above the South Bowl of Fire. It is interesting to meander around and see the different views offered down to the red rock. The large red "thumb" rises up around an outcropping. Stay relatively close to the edge of the plateau and when you arrive at a funnel descent, there is a faint trail that travels around the top of the funnel. Follow the trail around and up a small ridge. Next, drop into the adjacent wash and begin climbing. Anniversary Narrows Peak is ahead. The wash has 3 or 4 dry falls that can be negotiated on the left side. The trail leads up early before reaching these obstacles. Usually, there is a cairn at the top of the last dry fall to signal those hikers coming down from the peak. Next, climb the peak in front of you! Be careful and don't wander too far to the right where a cliff lies unforgiving. This is a steep climb but not too long. Anniversary Narrows Peak lies on Lovell Ridge. In fact, some hikers who've been around a little longer call this peak Lovell Peak. 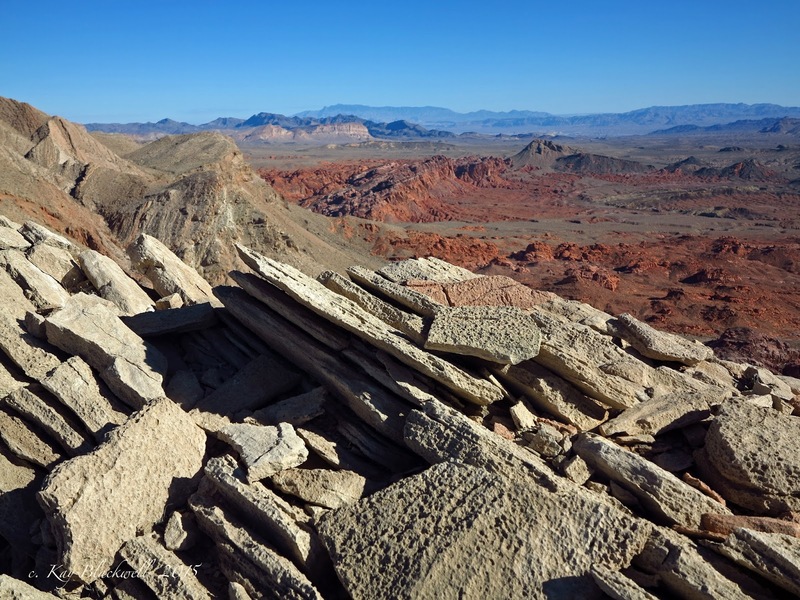 As you near the top, you can see all the way to Las Vegas on a clear day ... like today! 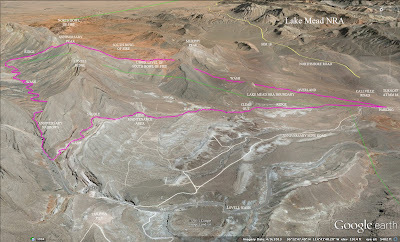 Behind you, Lake Mead. And, to the right, Muddy Peak can be seen past the immediate peak. 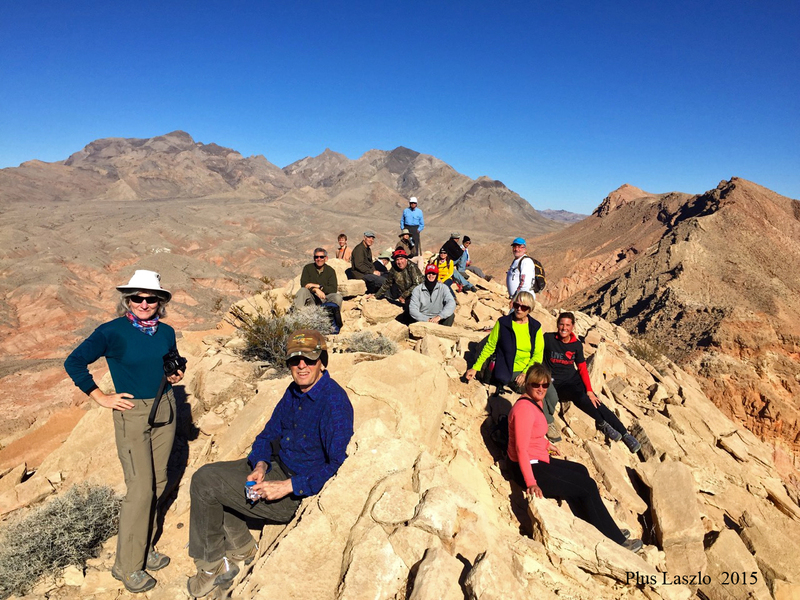 Today's strong group of hikers reached the summit and signed in with plenty of reserve energy. 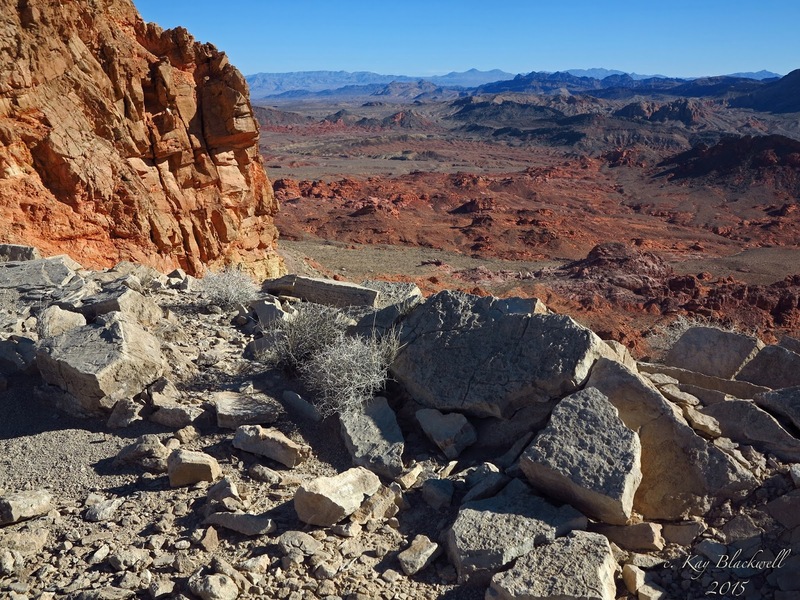 The view from there might be southern Nevada's best! 360 degrees of color and geology. We enjoyed our stay then prepared for the tricky descent down the knife edge ridge. (Okay, a wide knife.) A few hikers followed the ridge all the way down to the saddle. Others followed the usual route down the ridge, then the drop on the right, then the ridge and the trail on the left. One word of caution would be that the rock on the ridge is very "sticky" and will grab your shoes when you least expect it. Falling is NOT allowed! We gathered on the saddle and got one last gorgeous view of the South Bowl then turned left to go down the other side on the long intermediary ridge. There is a clear trail here. To our left, we could see the walls of the wash close in where Anniversary Narrows was formed. We carefully followed the ridge trail from the slippery beginning to the much easier end. At the bottom of this ridge, we went left to find a wash that led us down into the deeper wash. 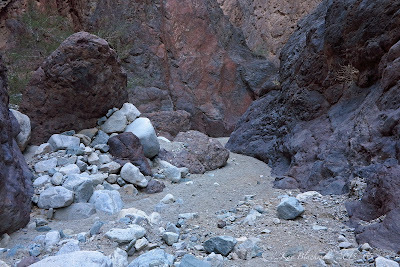 Although many of the cairns in this deep wash have been removed, it will be referred to as Many Cairn Wash as it was named the first time the writer hiked it. Many Cairn Wash is fun to descend. 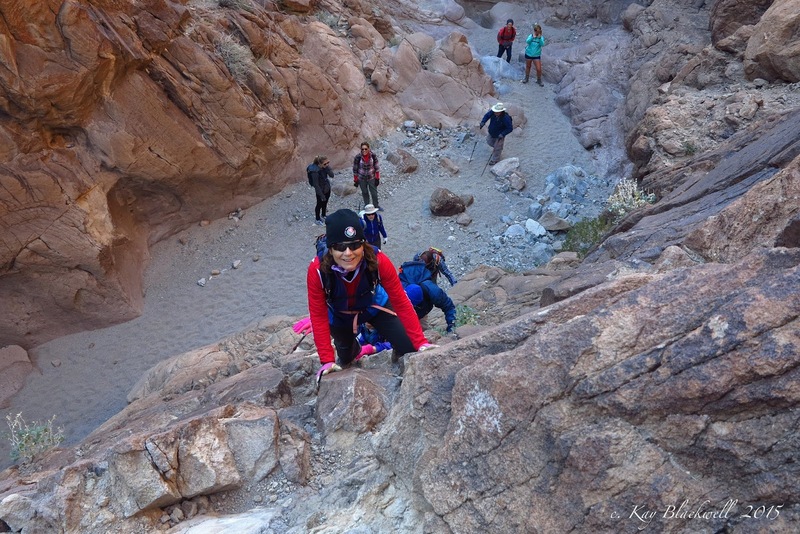 As one hiker put it, "I feel like a pinball bouncing off the rocks right and left!" There is around a mile of the wash before you spill out into a large gravel wash then yet another large gravel wash. Your direction should always be "down." Finally, the wide gravel wash rounds a curve and drops down into Anniversary Narrows. The narrows seems to have washed out a little since last year at this time. Some of the drops are a little bigger. Some of the group hiked through with nary a glance. But, others hiked through with cameras at the ready. Taking photos at every turn. The light was interesting today as it is the dead of winter and was around noon. 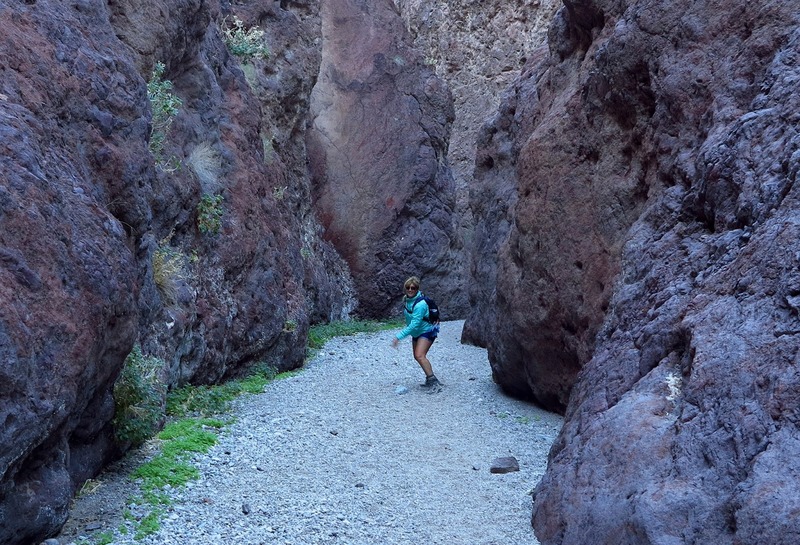 As we exited the narrows, we saw a couple of hikers about to enter. We questioned them about signs, etc. To our relief, there have not been any additional signs or gates erected. This meant that we would not have to backtrack over the peak to reach our cars. Yes, this is the only option for this loop hike unless you take a wider loop out to the West End Wash. (See the West End Wash / Anniversary Narrows Loop entry on this website.) It should be noted that the prospect of turning around did not deter any of today's nineteen hikers from going on the hike. 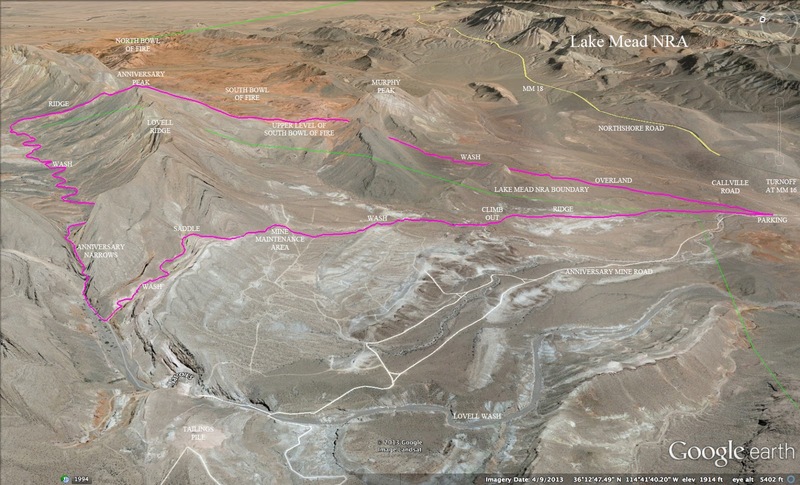 As mentioned before, it is very difficult to believe that this hike would be blocked off from the public. Not far from the narrows, we turned into a canyon wash on the left. We'll call this an "escape" wash! This is the beginning of the east route. The east route is too difficult for it to be called "family friendly" but, for regular hikers, it is a nice route. The wash begins easy enough but quickly begins a steep climb up through rock. The hefty climb ends on a saddle where a large arrow is made with rock as seen to the left. The arrow is pointing in the direction of the narrows. 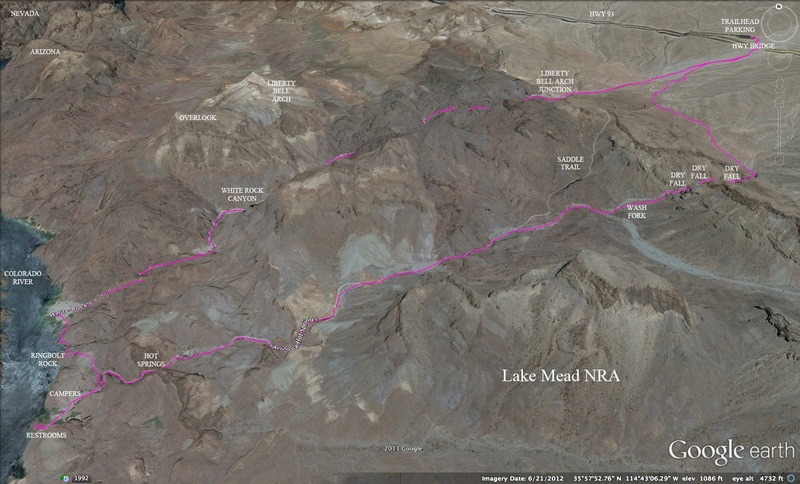 As we dropped down the following wash, we passed through the mining company's boundary. We quickly made our way across a graded area and down through the ridges and washes that came next. We did not see any No Trespassing signs on the eastern route. 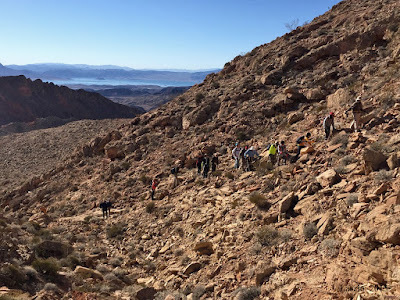 When we could, we connected with a deep wash at the bottom of the hill and followed it to a point where it was easy to climb out on the left side. From there we followed the ridge for a straight shot down to our cars. An option here is to follow the deep wash all the way out to the dirt road and turn left to get to the cars. Your choice! We were very happy to have been able to do this hike on such a beautiful day. Thank you to whom it may concern.